The idea here is to create few new branches of production chain, plus some extras which i'll talk later on. First of there is some room needed to breed and raise giant rats. Ratfarm room or whatever we call it. It may be eaither room on it's own, or attached to farmroom as improvement, like farmland is. I personally think it'll be more fit as another farm room improvement. Rats won't breed from air right? We need some kind of lair/nest where those can live untill fully grown. I think simple burrow would be enough for a humble rat. (maybe something else if we decide rats wont fit... underground razortooth pigworm then?). We can integrate rats to the farm room even more, and just allow placing burrows on farmlands. This way they will breed directly on an antroot field, which will let them feed on it als song as it's watered, take some work away from imps, and provide some place to live - at least 1 or 2 tiles for one rat (more space = faster growth, more burrows = less space, but more rats at once). Many times i saw they should get some beer... well that would certainly make it grow faster and get dumb enough to let others control it to some point. After rat is fully grown it is ready to be of some use to us. Who want grilled ratburger? So here's the first use of our rats - source of food. But first we need to prepare it somewhere. Butchery would be preferably a part of cookery room - piggehs there already have some butcher knives, so why not to use them properly instead of slicing bread? Butchery itself could be one tiled furniture like baking table. I see it as a bloody table with some hooks hangin above it and an oven/grill/rotating fork at the side. This way we wont clutter our room too much. Oven at the side with grill/roasting place. Visible logs below to see how much filled it is. Some hooks to show raw meat reserves. A slughtertable on the right. It's also possible to rework baking system a bit. We would just divide cookery workspace to tables and ovens. This way there would be no need to have separate baking table, butcher table, whatever table and/or oven for each.once there is enough resources to make some food, one of tables would be reserved, and preparations would be done one it. Then prepared food would be transported to separate oven. This way most types of food could be produced. Youd could even use tables to make both meat and bread. Bake and cook them at the oven, and them make a burger from both at the table again . This kind of food (both steak and burger) woud have some bonus effects. Some strength/endurance buff, or just raise happines like any fastfood does... mostly. I think someone made very large post with ideas, with quite good part about foods, so i think there is no need to double it. And food itself is out of scope here. Apart from meat killing those giant rats would give us some additional reasources. Enemies stopped invading your dungeon? No problem now, since rats will leave you some bones and leather hides aswell. There can be more of them like eyeballs and, let's say, stench fluids that could be used during research or to make some nasty spell using alchemy. (assuming something similar will be implemented someday). There was few topics about it. Namely strong animal, easily controlled (unless hungry) could do some mining and most of all carry large bags that imps would fill with items. As for mining, i dont see it as super quick digging machine, but maybe if some enemy dungeons are implemented, then they could serve as siege force that could break trough reinforced walls faster, while armored imp would throw burnig coals into enemies from it's back. Slow but steady as they say. In ratfarm there will be option to assign rats as workers (both carrying/mining) - which will link it to one of your imps to controll it. Im would keep it on a leach, or just ride it. Probably the best solution here would be to set ammount of rats we wish to maintain working through creatures menu, or rightclicking creature icon next to other creatures icons at the bottom of the screen (icon would appear once we have working ratfarm) then simply typing number. Apart from being decent workforce rats would be less vulnerable to attacks and able to defend themselves. They'd be somehow more cowardly than they unleashed brothers due to cowardly imp on it's back. You pobably remember arena from DK2 right? Why not to make something similar here? Just an improvement tile in training room - fighting pit, and trapdoor at a side to throw in enemies and take out fallen creatures. It would make great way to provide happines to some creatures (probably orcs mostly). But what evil dark dungeonlords are we to care about "happines"? It will be great way to dispose captured enemys to the other world and provide some good training to your minions at the same time. But what if there is no enemies in your prisons? Your lovely rats can replace them, or even rats alone could fight against each other and let your creatures bet on the winner. Rats won't have any lair in bedroom, so they'd be one time use creatures, thus arena would require frequent delieveries from farms. In training room with fighting pit however, you'd have option to set number of rats you wish to fight at the arena at one time - similar to number of imps assigned to room for example. You could lower or raise number of them, and imps will try to keep that many rats all the time taking adult rats from farm. From time to time some daring creature of yours would challenge creature at the arena and jump in to the pit to fight it. This may be disabled/forbidden, set as neutral/leave creatures the choice to fight, or you could send/force some your minions to fight. Sometimes your loyal imp could just sell some well aimed kick to creature happily taunting pitfighter, thus pushing him down and forcing him to fight. So you have some fat, hungry beast, and don't want to eat it or watch it anymore? Grab some chains and hook - set then in vulnerable passage or where you expect enemies to come. Then finally lock those chains around your stinking rat. The more hungry it gets, the more vicious it becomes. Beware however, as it may attack your creatures as well when hungry enough - that's what the chains are for. So basiaclly small iron nail with chain to make rat stay at place and guard it... There would be option to release rat and let him attack (enemies hopefully). Another option to disable this ratpost, and imps will stop bringin new rats to the post. Doesnt seem very trappy if you can see it from afar? I know two ways to make it more surprising. Another trap is similar. Same cage, same rat and same hero. The difference is that rat is under the floor. Once enemy steps on a trapdoor it opens and hero falls to feed our rat. He won't be able to escape until cage is broken, and it may take some time. Actually it may be one and the same item to build, the function would be determined by how it's placed. If it's standing alone in some room, then it's a regular cage. If it's placed instead of one of wall segments, then it would be hidden wall cage. If it is placed in pit in the ground surounded by walls, then it would function as trapdoor surprise. Only a few herose that would be on a trapdoor when it opens would fall in. The trap would remain open and visible while thare is hero there, and some time after fight is over. If it's destroyed both rat and his victim escapes. Rat is still hostile to everything. ---- or raised directly on a farmland, then they don't need root delievered separately as it is on place. 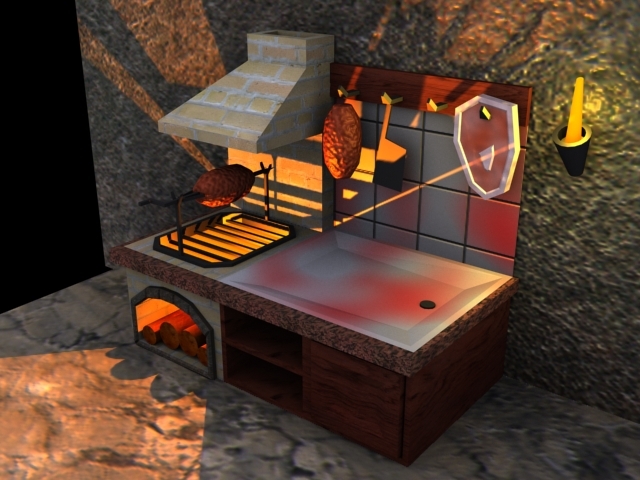 ---- butchery - kills rats and cooks meat. ---- optionally separate oven to cook all, and tables too prepare everything. ---- fighting pit - rats, heroes and creatures fight here, and have fun. * Eyeballs and other alchemylike ingredients. * optionally iron claws/jaws if assigned to trap. * Traps, ambushes and securing perimeters. Hope you like it. Let me know what you think about it. Rats are only placeholder here, they may or may not be there at the end, replaced by something else. So i ask you to discuss mechanics mostly, rather than molerat itself, as it has separate topic.